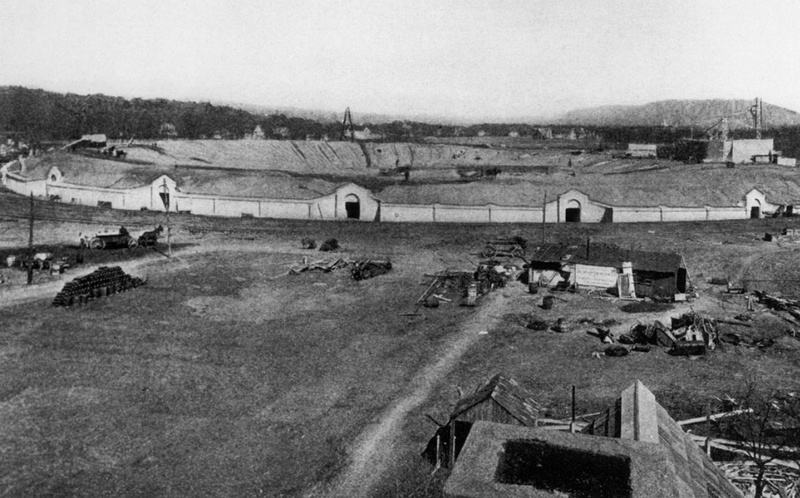 Construction of the Yale Bowl, 1913. And here our troubles began. Welcome, reformers. We’ve been hoping you’d arrive. I too have my torch and pitchfork, and I trust we can all agree there’s more than one tweak to be made when it comes to revenue sports. I’m proud to announce I’ve discovered an “ideal of the amateur coach.” Compared to the thin and meager history behind that wobbly and dubious model of the amateur athlete, I can footnote my exciting new ideal something fierce, citing precedents dating back to Socrates. Henceforth coaches will receive no outside compensation, no endorsement deals, no fees from speaking engagements, nothing. Schools can pay for a coach’s room and board and a few other incidental expenses, but that’s it. After all, college sports are not about the coaches. How many people do you think would come out to see John Calipari coach a bunch of D-League players? The “Bad sports! Mess you up!” contingent, which feels that sports are a peculiarly American blight. This is a good contingent to have on your side when an egregious stadium or arena financing package rolls down the pike, but in this case solving what ails college sports will have to call upon better arguments than “Stop caring about the games.” Sports mess people up the world over and have been doing so for a very long while. If you want to have a booth outside the arena and proselytize all comers on the sham and the lie that is sports, that’s fine. You and I have more in common than you think, for tomorrow I’ll borrow your booth, switch out the brochures, and set up shop outside Cirque du Soleil. The wish-fulfillment section of the crowd, comprised of people who plainly want to see the NCAA at long last get its comeuppance. My comrades in this part of the tent are certain that Ed O’Bannon’s lawsuit will seriously injure the NCAA, assuming the organization loses in court. I’m not so sure. To my eye the organization in Indianapolis has a fairly healthy revenue stream. I’ve also noticed a distinct lack of NFL owners selling apples on street corners even though they’ve had to compensate athletes for the use of their likenesses now for a good long while. Undergirding both camps and furnishing a common set of rhetorical bases to be touched (everything from Mark Emmert’s salary to those darn press-row cups) is what in the past I’ve referred to as a rich vein of reformist outrage. I actually have two reservations here as well. First, the vein treats “revenue sports” as a single undifferentiated object, while I wonder whether the situation faced by basketball players isn’t actually much different — and specifically much better — than that confronted by football players. If a basketball player doesn’t want to be exploited, Mark Cuban is always nearby banging his drum and signing up all comers for the D-League. You can do that right out of high school, be paid straight up, and probably develop your game as fast as or even faster than you would in college. You have to be good enough at the sport to attract Cuban’s eye, of course, but these are the same elite players who are also most attractive to Division I. If I’m the NCAA and my continuing existence is largely funded by a single three-week annual basketball event, I will at least do some robust “what if?” planning for the scenario where players actually start taking Cuban up on that offer. But that’s just me. Second, I suspect a rich vein of reformist outrage may be less effective in practice than working continuously, inquisitively, and above all visibly to build better and better mousetraps. These are not mutually exclusive courses of action, but it may be no accident that the latter population is so often smaller than the former. A good many people far brighter than I have studied the antecedents of long-standing problems and then parlayed their outrage into something logically consistent yet tonally more persuasive and possibly more productive. As my great teacher James Carey put it, people who’ve had epiphanies can make poor traveling companions. A half-cenutry ago the constitutional historian Leonard W. Levy was outraged when he emerged from the archives, but when he came back to the same question a while later he said, in effect, my footnotes were impeccable but I now have a different tone that I think is more apt. Historian Richard Hofstadter was famously outraged when he came out of the stacks with the research for his first major work, but when he returned to the subject a few years later he said, in effect, my research was beyond reproach but I now have a different tone that strikes me as somewhat more finely calibrated. Because I’m basically a helpful sort, I went ahead and proactively offered this same kind of “monumental research, but why so angry, bro?” service on behalf of our nation’s most influential historian of college sports. Opportunities to offer this service recur fairly often now, and that tells me this question is at the top of the agenda. It should be. It’s been pending for a while now. Maybe my fellow travelers in the big tent are right, and we’ll look back in a year’s time or three and say this problem really did come down to the presence of a few unusually avaricious and self-interested people in a few key positions. If so, that will be great. It will mean this was one easy problem to fix. A few key retirements and a couple rounds of attrition and we’re in the clear. If not, however, we may find we still have work to do. Whether or not the NCAA and the largest conferences have a change of heart, we will still have high-revenue business enterprises that produce, market and sell football and basketball located physically and organizationally within high-revenue educational institutions. Some people find this coincidence of location lamentable in and of itself. I don’t, and, even if I did, I suppose 2014 is rather late in the day to file that particular objection. But I’ll cheerfully admit that it is just that, a coincidence. There’s no necessary connection between these two activities, it just sort of happened a century ago. Working without much if anything to go by in the way of precedent, Yale surmised that spectators would materialize to fill a new 70,000-seat football stadium. MIT had already opted out of football a decade earlier, and the University of Chicago would eventually do so in 1939 (“college football is an infernal nuisance“), but just about every other major institution made a conscious or unconscious decision to ride the tiger. The university presidents making that critical decision could never have foreseen that in a relatively short time spectators anywhere in the nation would be able to watch these games. Even as recently as 20 years ago there was little indication that live sports would take on added luster over and above other media products for advertisers chasing increasingly elusive eyeballs. At a minimum, then, the hoops college sports had to jump through to create vast piles of revenue and land us in this mess were: 1) mass-spectator sports taking root on campus; 2) broadcasting being cracked open to increase the number of channels from just a few over the air to hundreds via cable or satellite; and 3) the advent of recording and streaming technologies, as well as user habits, that have made sports more attractive as a media property. If somehow we could convince Emmert to pull a George Bailey and wish the NCAA had never been born, I suspect we’d find all three of these developments would have happened in more or less the same way. Nevertheless let’s go ahead and say that we’ll wake up tomorrow and find that the NCAA has indeed never been born. Meanwhile on the very same day the major-conference commissioners have also decided that at this point in their careers golf is way more fun than getting out of bed every morning only to be compared to Henry Clay Frick yet again. The field is ours. Now what? Now you’ll find me over here with the #smh meliorists. Maybe we can put something together that works much better for athletes, something that furnishes them with scholarships that cover them for longer durations and for a more varied set of contingencies, better insurance coverage, mere adult normalcy with regard to agents and contracts, and, yes, a trust waiting at graduation funded with a share of the revenue that they help to create. Experience will be the only possible source for answers on the “What do we do about X” questions that will ensue, so by all means let us begin acquiring that experience. This entry was posted in florid historical references, in many ways the work of a critic is easy, post-mandatory-amateurism planning, stay off my side on April 2, 2014 by johngasaway.